Linda Burton posting from Topeka, Kansas – The inside of the Kansas State Capitol shines. Gleams. Glows. The marble floor is mirror-like, reflecting every hanging light; when you stand in the middle of the rotunda you can even see the dome looking back at you. But look up. There is almost too much to see; Andrea, our tour guide, pointed out the light-filtering glass bordered by shiny copper strips, the stunning copper columns, the 900-pound chandelier. Colorful murals surround all of that; look east to see the Knowledge panel, with Temperance to the left and Religion to the right. South is Power, and soldiers of war; west is Peace, with Science and Art; north is Plenty, faced by Labor and Agriculture; drama and ethics, overhead. Andrea told about the restoration; a multi-year project begun in 2002 and still underway. The shiny copper we saw today had blackened over the years; the colorful walls and stenciling had been painted over. “It was dull,” she said. “and dark. Now when you look around…” she waved her hand in a wonderment gesture, “well, it’s just awesome.” We agreed, and clicked our cameras. I asked about the flags I’d seen in a picture. “We still have the flags,” she replied. “But during the restoration the holders got misplaced. We’ve ordered new holders,” she laughed. The eight flags represent nations that claimed all or portions of what became the state of Kansas – Britain, France (twice), Mexico, Spain, Republic of Texas, plus of course, the United States and Kansas flags. 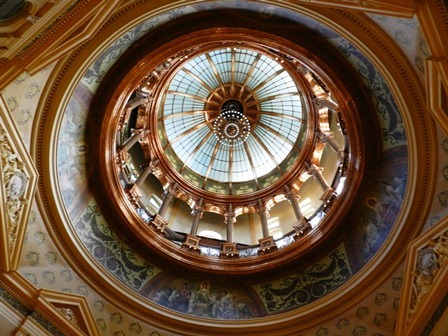 “When we’re done with the exterior work on the dome,” Andrea continued, “we’ll open it for tours again. If you can climb 296 steps you can walk around the balcony up there.” Today however, we headed for the vintage elevator and the third floor. Andrea guided us to the east segment of the building; it was the first portion built and put into use. The cornerstone was laid October 17, 1866 but the brown stone used in the foundation didn’t harden sufficiently; following a harsh winter in 1867 it crumbled and had to be replaced with a harder limestone. 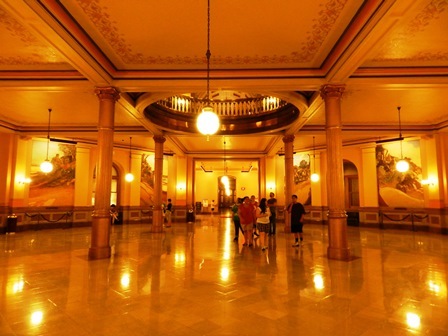 The legislature first met in the building in 1870; it was finally completed in 1873. 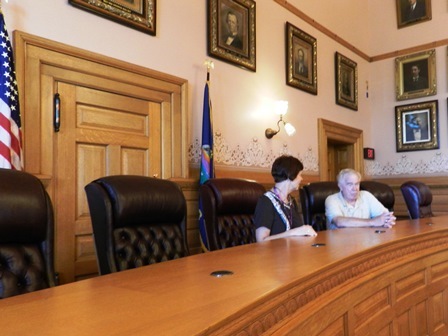 We walked into the Senate Chambers; its restoration was done in 2005. 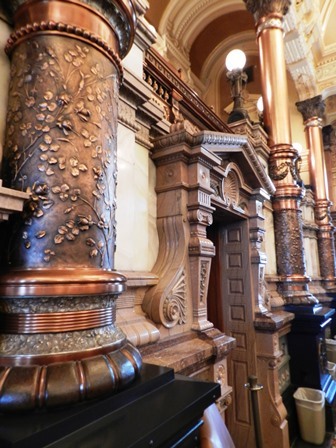 The copper columns once again have their original gleam; we admired the hand-hammered vines that twined around the bottom of the posts; posts that cleverly combined beauty and function; on the sides of the bases ornate circular grills were designed as air vents. The Senators desks, made from native Kansas cherrywood, were returned to their original semi-circle placement during the restoration; marble walkways and carpet and chandeliers were replaced; the room once again has its 1880’s ambiance. 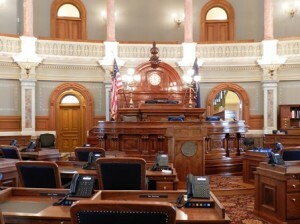 The Kansas capitol was built in three parts. Work on the west wing, which is wider and longer than the east wing, was begun in 1879 and enclosed by 1880. I asked Andrea about the “Cave of the Winds” – a story I’d heard long ago. It was really a covered wooden bridge, called the Cave of the Winds because of its draftiness, and it connected the two wings before the central building was in place. I imagined legislators walking between the two buildings on a blustery day, with papers and hats flying every which way. The House of Representatives first convened in the west wing in 1881; it was partially renovated in 1998 and completed in 2008 with new electronic voting boards, desks and chandeliers. 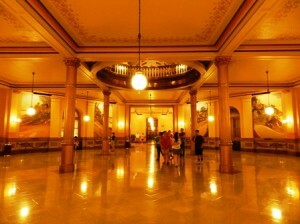 The colors have been brightened and the stencils and allegorical murals uncovered and restored; the gold leaf on the ceiling and at the top of the pink scagliola columns shines; the room radiates warmth, and charm; a good place for the 125 representatives to go about the work of the state. Construction on the north and south wings began in 1883. Workers identified what they thought was a spring while digging the 25-foot-deep foundation. 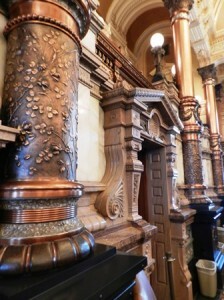 (During the recent multi-year renovation the water was confirmed to be moisture in the bedrock from the Kansas River.) The contract for the roof and dome was let in 1889. The Capitol was officially completed March 24, 1903, at a total cost of $3,200,588.92, thirty-seven years after work began. Andrea led us into the Old Supreme Court Chambers in the south wing, where we got to sit at the judges bench, (the Supreme Court meets in the Kansas Judicial Center across the street now); and into the State Library in the north wing, where we got to climb the stairs and walk on the glass floors above the stacks. Any Kansas state resident can get a library card and use the library today, it holds more than 200,000 federal and state documents. A ride on the vintage elevator (still operated by a real person) took us down to the second floor and the governor’s ceremonial office, where we got to sit in the governor’s ceremonial chair, and admire the items on display, such as the bison head and skin, the sunflower portrait, and the prairie chickens. A walk in the hallway took us past the Curry murals, the Winter murals, and the rotunda statues. 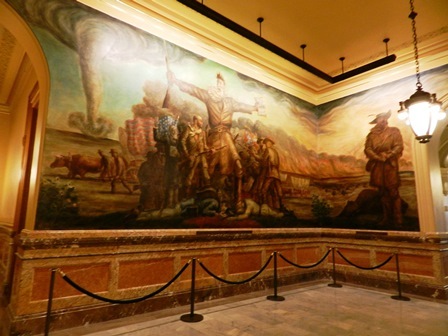 As with much public art, tastes change and opinions vary over time; the murals created by John Steuart Curry (1897-1946) caused one of the biggest art controversies in recent times. Curry, a contemporary of Grant Wood and Thomas Hart Benton, painted Tragic Prelude in 1940; his interpretation of John Brown and the antislavery movement in Kansas Territory before the Civil War is larger-than-life and stunning. With a backdrop of the natural disasters of tornadoes and prairie fires, abolitionist John Brown stands wild-eyed atop two dead soldiers – Union and Confederate – with a Holy Bible in one hand and a Beecher’s Bible in the other. (“Beecher’s Bibles” was the name given to the breech loading Sharps rifles supplied to the anti-slavery immigrants in Kansas.) Curry painted the mural directly on plaster; when Lumen Martin Winter (1908-1982) was hired in 1976 to complete the artwork in the rotunda, he painted his scenes on canvas; most likely to avoid the criticism that Curry endured. The rotunda statues were done by Peter Felten Jr (b 1933), a native of Hays, Kansas. 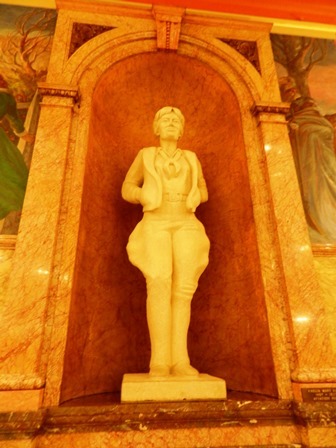 He used limestone from the southern part of the state for the monumental two-thousand-pound statues of four famous Kansans –William Allen White, Arthur Capper, Amelia Earhart, and Dwight D Eisenhower. William Allen White (1868-1944) was a newspaper editor, politician, and author; he won several Pulitzer Prizes. Arthur Capper (1865-1961) was the 20th governor of Kansas and a US Senator from 1919 to 1949; you know the fame of the other two. The tour ended and Andrea bid us goodbye but beckoned me back to her desk, where she hand-lettered a document for me certifying that I visited the Kansas State Capitol on June 11, 2013, my 33rd stop “as part of a quest to visit all 50 state capitol buildings.” These nifty certificates are provided by the Kansas Historical Society; the state motto curves over their name – “Ad Astra Per Aspera.” To the stars through difficulty is the meaning. 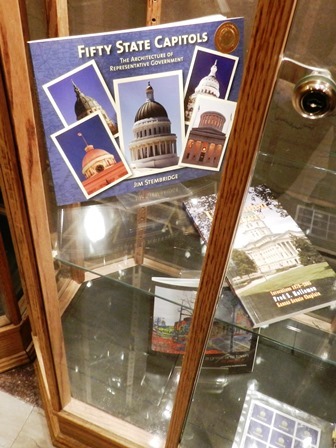 I was delighted with my personal gift; and delighted to see Board Member Jim Stembridge’s book Fifty State Capitols for sale in the gift shop. 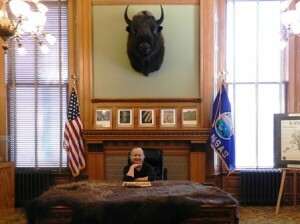 Thanks, Kansas! 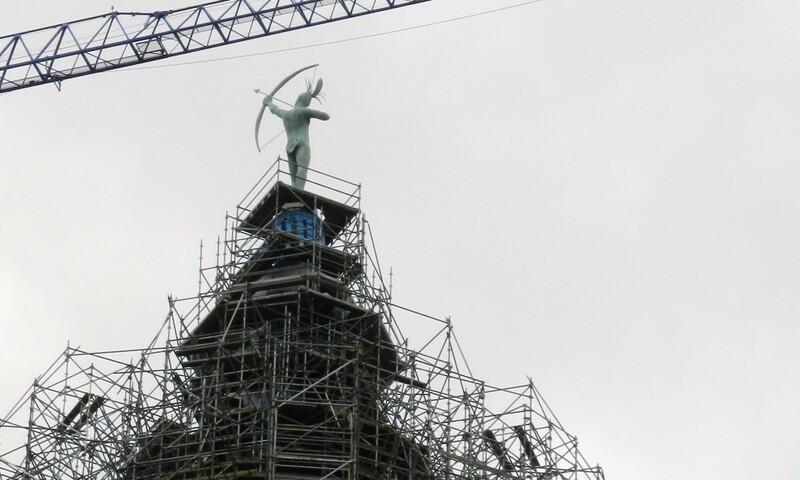 Out on the sidewalk, I looked up to see Ad Astra standing atop the dome, his arrow pointed towards the north star; representing a Kaw warrior and leader, this statue was added in 2002. The building is covered in scaffolding now, and monster cranes are delivering construction materials to the very top. Outside restoration is taking place now; soon the copper surface of the weathered dome will shine, just like new.